Conventional wisdom tells us to hide a new feline family member away in a room for a few days, or even a few weeks. The theory is that the resident cats and the newcomer will get used to each other's scents before they're formally introduced. But most cats don't buy into the conventional wisdom on anything -- including introductions. And it's possible that all that time in isolation will make your new cat edgy and nervous about the enemy on the other side of the door. This is the way my cats and I like to welcome newcomers to our home, and it's never let us down. — Set the new cat up in her own room with food and water, a litter box, toys and comfortable places to nap. The room should have a sunny window. Shut the door, and give the cat time to adjust to her new surroundings. — After a few hours, open the door. Let the cat venture out when she's ready. If she wants to spend several days hiding under the bed in "her" room, let that be her choice. Chances are, your resident cats will respect her space and leave her alone. If you feel you must keep the cats separated, put a screen door at the doorway to the new cat's room so she and the resident cats can see each other and get acquainted. — When the cats meet, they'll hiss and growl. But most neutered cats hate to fight and will avoid confrontation at all costs. Watch their body language. If one starts grooming, yawns or turns her head away, she's giving the other cat an opportunity to leave the "battleground" without losing face. - Be patient. 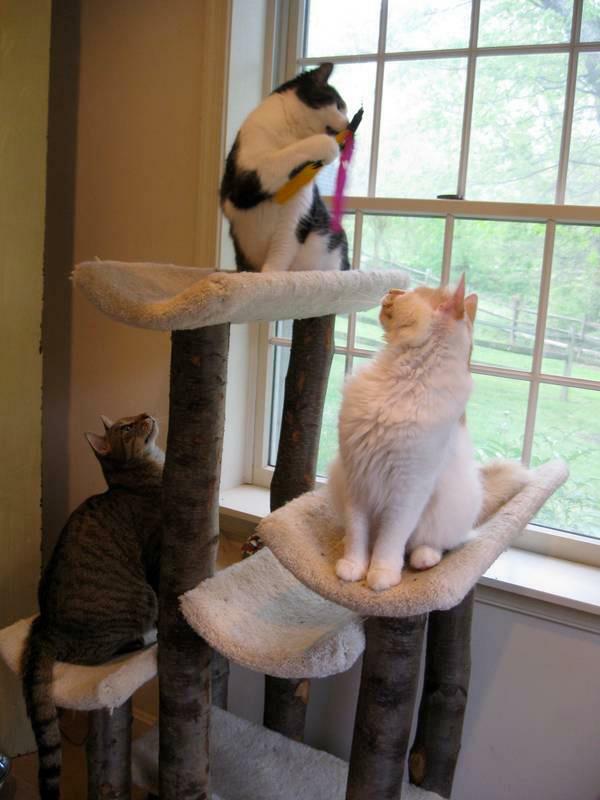 It could take days, or even weeks, for the cats to work things out and for the newcomer to learn the house rules. Meanwhile, the cats will pick up on your feelings. If you act like having a newcomer in the house is perfectly natural and not a big deal, the cats will probably agree. TIP: Let the new cat explore on her own. Don't pick her up and put her down in a different room. Cats leave signposts for themselves with the scent glands in their paw pads and cheeks. Without the ability to create signposts for herself, the cat could become frightened because she'll think she won't be able to find her way "home" to her room. Here are some ways to help your original cat and a newcomer become friends. - Make the original cat feel special. Give her the most praise and attention, even if that means ignoring the newcomer. The new cat will understand. Her feelings won't be hurt! - Do fun things. Help the cats associate pleasant experiences with each other. Play with them together. Or feed them together. Sitting on the floor and with the cats and giving them all treats at the same time is a great “icebreaker,” too. - Don't Force Things. Never force the new cat to come out of her room or associate with the other cats. She'll do these things when she's ready. It may be weeks before she's ready. - Set A Time Limit. Decide how long it should take for a new cat to begin feeling comfortable in your house. If after, say, three months, she's still not fitting in, it's time to look for a new home. It's better to rehome her before she forms a strong bond with you. If she came from a rescue, the group will probably want her back.